Rhonda Jean Whitehill, daughter of James Edward and Nancy Rae (Keele) Whitehill, was born on November 10, 1961 in Shenandoah, Iowa. 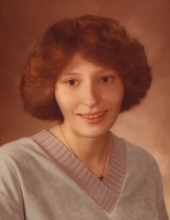 She entered into rest on Thursday, October 25, 2018 at Elm Heights Care Center in Shenandoah at the age of 56 years, 11 months, 15 days. Growing up Rhonda attended the Shenandoah Community Schools until the family moved to Nebraska City, Nebraska. She graduated from Nebraska City High School with the Class of 1980. After graduating, Rhonda moved back to Shenandoah, where she worked at Godfather's Pizza. She also worked at the A & W in Glenwood and last worked as a Resident Treatment Social Worker at the Glenwood State School. She had most recently been a resident of Clarinda, Iowa. Things that brought a smile to Rhonda's face included playing cards and shooting pool with friends. She also enjoyed word search puzzles. Preceding Rhonda in death were her parents; paternal grandparents, Lee and Opal Whitehill; and maternal grandparents, George and Naomi Keele. Left to cherish her memory are her son, Corey Whitehill and his special friend Andrea Cox, two granddaughters Alexis Whitehill and Huxleigh Whitehill, all of Shenandoah, IA; three brothers, Larry (Pat Glassinger) Whitehill, of Farragut, IA, Randy (Sherry) Whitehill of Troutdale, OR and Lance Whitehill of Shenandoah, IA; nieces and nephew, James Whitehill and Katie Whitehill of Troutdale, OR and Paydon Whitehill of Shenandoah, IA; many aunts, uncles, cousins and other relatives; and many friends. Celebration of life graveside services were held on Tuesday, October 30, 2018 at 2:00 pm at the Rose Hill Cemetery in Shenandoah with Jeff Hiser officiating. The family greeted relatives and friends with visitiation one hour prior to the service at the funeral home beginning at 1:00 pm. Memorials are being directed to the family.